XL 28350 Ft** Egyeztetés szükséges! Thanks to its SHOTGUM foam & X10D neoprene structure, the Boom vest is super protective and comfortable at the same time. 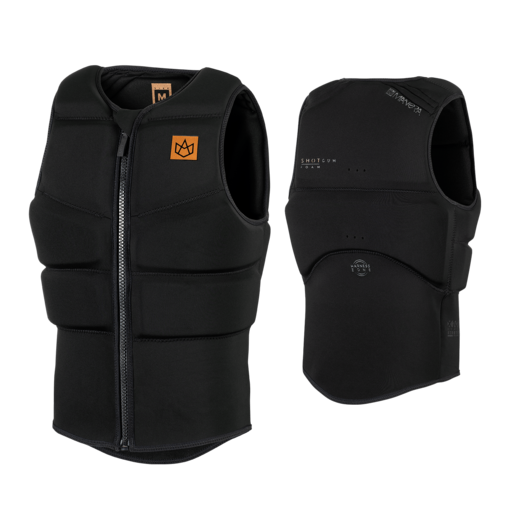 It features an anti-slip technology that keeps the vest in the right position and a harness zone without foam for the harness. Put it on like a jacket thanks to the zipper. The SHUTGOM foam is super effective thanks to its large inner aircells and its manufacture process that give unbeatable shock absorbent. The quality of our X10D neoprene is not to prove anymore, with incredible stretch, durability, softness and UV resistance characteristics. The Kitesurf vest has a special zone with no foam panels to let the harness go around the waist without discomfort. An inner special ANTI-SLIP material is printed all around the waist of the vest, it keeps the impact vest down and prevent it from going up. Thanks to its large inner aircells and it’s manufacture process that gives unbeatable shock absorbant, softness and lightness abilities, the SHOTGUM foam will make our impact vest the most comfortable and effective one you’ve been trying out. The structure of our vest is made with none other than the X10D neopreneused in our wetsuits. The quality of this neoprene is not to prove anymore, with incredible stretch, durability, softness and UV resistance characteristics. An inner special ANTI-SLIP material is printed all around the waist of the vest. This material is sticky but soft andflexible, it keeps the impact vest down and prevent itfrom going up when moving/crashing, or with the harness pulling upward. The Kitesurf vest has a special zone with no foam panels to let the harness go around the waist without discomfort. This is the HARNESS ZONE. Kapcsolódó linkek "Boom impact vest Black férfi mentőmellény"
Vásárlói értékelés "Boom impact vest Black férfi mentőmellény"